Ticks are best known for being the nasty bloodsuckers that spread dangerous infections like Lyme disease, the Powassan virus, and babesiosis. For the most part, their range across the US is spreading, and so are the infections they carry. In surprising news, a study published in the journal Antimicrobial Agents and Chemotherapy describes how scientists took a protein from the Ixodes scapularis tick and used it to battle one of our most deadly superbugs, methicillin-resistant Staphylococcus aureus, also known as MRSA. I. scapularis is the same tick that transmits Lyme disease and other infections to humans. Once mostly found in hospital settings, MRSA is spreading more frequently in local communities. Staph bacteria live in the nasal passages of many people and, according to the Centers for Disease and Prevention, about two in every 100 people carry MRSA. 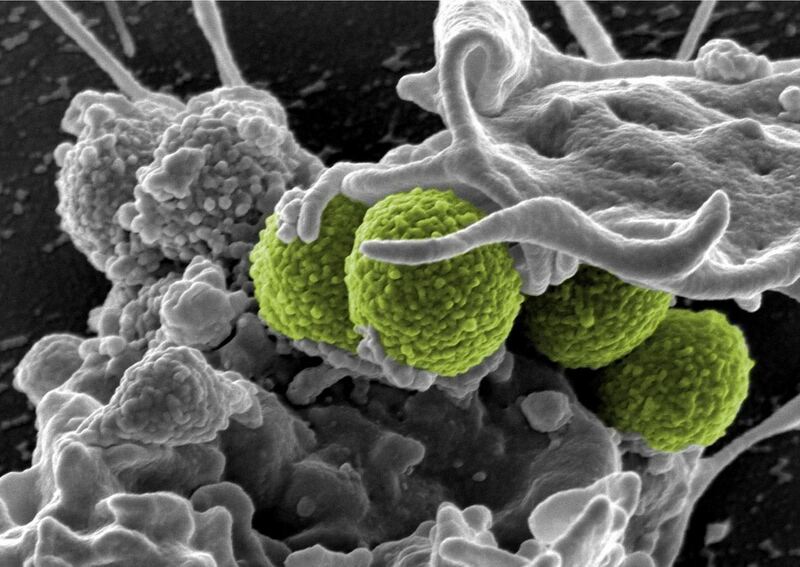 In hospitals, MRSA often emerges as a bloodstream infection associated with devices like central lines used to draw blood and deliver drugs to critically ill patients. These dangerous infections are even worse if they form biofilms, invasive bacterial communities that live on surfaces or in the body and can be tough to disrupt and disinfect. Each year in hospitals and homes, there are about 90,000 MRSA-related infections. Of these patients, about 18,000 die. Biofilm infections in the body are often highly resistant to treatment. The community of bacteria organize in layers, ensuring survival, even if antibiotics kill fringe members of the group. The community lives in a protective biofilm, and slow-growing bottom bacteria are less susceptible, ready to replace community members killed by drug treatment. In the Yale study, scientists explored how compounds from ticks can fight dangerous MRSA communities, with surprisingly good results. While you would not think of ticks as harboring anything but infectious bacteria and viruses, they do have natural proteins that protect them from subzero environments. These appropriately named antifreeze proteins do just that — they prevent the organism, like fish, insects, or plants, from dying in the extreme cold. In this research, Yale scientists used antibiotics combined with two compounds made from I. scapularis proteins to evaluate the effectiveness of treatment of MRSA infections in lab assays, and in mice and flies. Increasingly, medical researchers are combining antibiotics to improve their ability to fight drug-resistant bacteria. Often, chemical combinations can provide better outcomes than one chemical alone. The National Institutes of Health began looking at antibiotic combinations a few years ago. When combined with antibiotics, IAFGP alters the formation of bacterial biofilm communities. Reducing, or preventing, the growth of biofilm makes bacteria easier to treat. The combination of the tick protein and peptide, together with antibiotics, reduces the selective pressure for S. aureus to develop drug resistance. The success of these combinations in laboratory assays carried over to tests with mice and flies infected with staph. The tick peptide alone, called P1, was successful enough for study authors to suggest it could be used as a protective coating for indwelling pacemakers, prosthetic implants, or heart valves. The peptide/protein combination did not increase the efficiency of all antibiotics. "If you take this protein and you add it to the current treatment, it makes the treatment much more potent," said lead author Erol Fikrig, chief of the Infectious Diseases Section at the Yale School of Medicine, in a press release. Overall, combining antifreeze proteins and peptides from ticks with currently available antibiotics reduced the virulence of staph pathogens to levels where they could be attacked by an immune system and antibiotics. Considering the damage usually caused by ticks, that is a pretty good deal.